Mozilla Thunderbird is a multidimensional platform which renders services like emailing, RSS Feeds and client chat. The platform is an open source which is free to download and install without any technical assistance like other downloadable software. It is best used by Mac systems but sometimes some technical issues hamper the email functionality of the application. 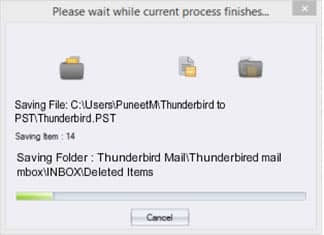 Moreover, other minor issues like installation problems, issues with send/receive of emails, frequent appearance of error messages are also the participating issues in Thunderbird email client.. Sometimes the MBOX files of Thunderbird email client is not accessible. 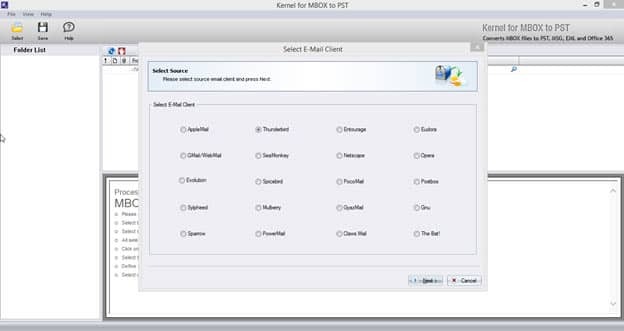 To access them, assistance from a third-party tool like Kernel for MBOX to PST is required. 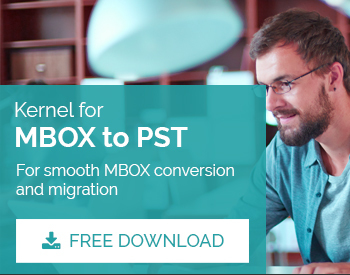 This third-party software converts MBOX file of Thunderbird to PST without compromising on the content quality and folder hierarchy. Click ‘Thunderbird’ radio button displayed on the Thunderbird to Outlook converter tool’s interface. 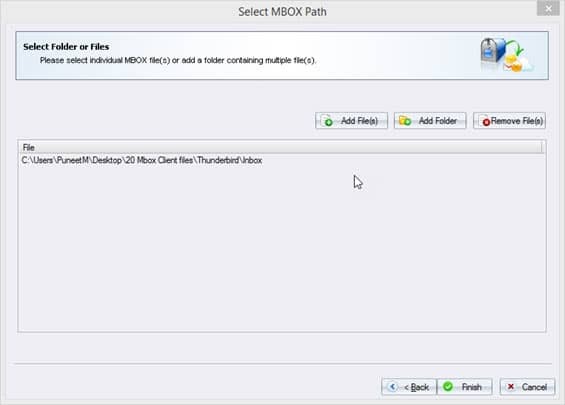 Click ‘Next’ to add the concerned Thunderbird MBOX files to be converted. 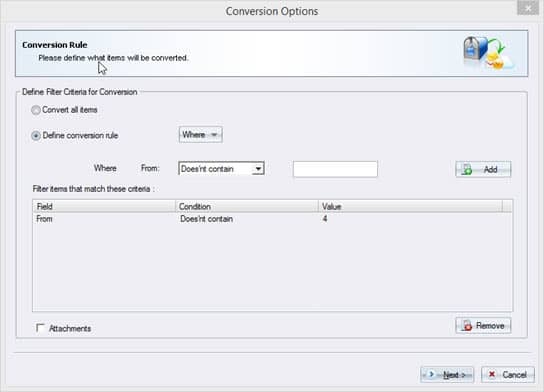 Add the relevant folder to proceed conversion. If any need to delete the attached file is felt, then it can be done by selecting them and clicking ‘Remove File(s)’. Once done, click ‘Finish’ to proceed. The next window of the software interface shows the selected Thunderbird MBOX files. 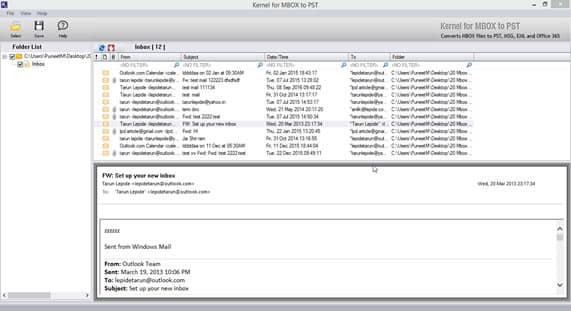 The detailed structure of each inbox files can be viewed on the right pane of the Window. To save the results, just click the ‘Save’ button located at the top of the interface window. 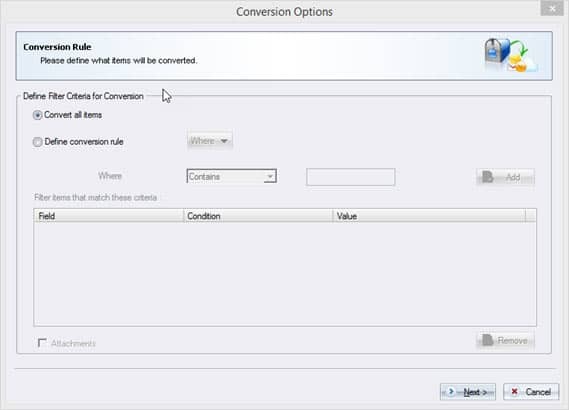 Once clicked the conversion options window appear. Just make selection among the two options, namely: ‘Convert all Items’ and ‘Define Conversion Rule’. To convert all MBOX files of Thunderbird to PST, simply click ‘Convert all Items’. However, if certain selection criteria are to be introduced, the ‘Define Conversion Rule’ must be clicked. In ‘Define Conversion Rule’, the criteria selection is to be made from the drop-down menu of ‘Where’. It entails different options like ‘From’, ‘To’, ‘Subject’ and ‘Date’. In ‘From’ field, select either off the options ‘Contains’ or ‘Does not Contains’. Once done, the value is entered. Like ‘From’ field, the entries must also be made in ‘To’ field, if selected. The ‘Subject’ field is not an exception. The values are entered as per the requirement. The ‘Date’ field is bit different from other fields. Here, select the date range in which there is the possibility of availability of the concerned files. Click ‘Next’ when the selection of conversion options is complete. The new Window will open that presents different saving options like ‘Save in PST’, ‘Save in MSG’, ‘Save in EML’ and ‘Save in Office 365’. 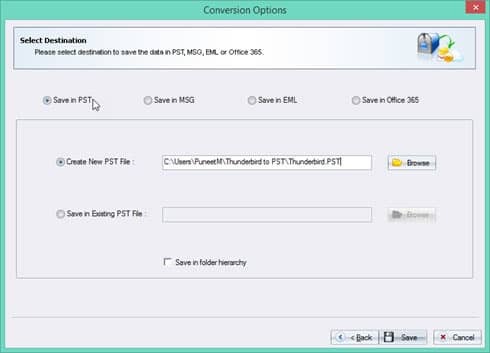 To save MBOX files of Thunderbird to Outlook PST click ‘Save in PST’ radio button. Once ‘Save in PST’ is finalized, select the PST file destination from two given options: ‘Create New PST file’ or ‘Save in Existing PST File’. Click ‘Create New PST File’ and create the destination folder. It will automatically create the PST file path. Click ‘Save Existing PST File’ if PST file pre-exists. To save the content in folder hierarchy, check the checkbox that reads ‘Save in folder hierarchy’. On the successful completion of the saving process, the message is displayed on the screen.